Two movies, parts 1 & 2, released a month apart. Here’s the second volume with a look & feel fairly similar to the first. I haven’t seen Part One yet, so it’s hard to judge this one. But if you’ve heard about it you know it’s very explicit, very adult. I’ll wait to watch them both together. Dallas Buyers Club took America by storm right before Oscar time last year, creating a ton of buzz, catching the attention of millions, and ultimately winning multiple awards. It was nominated for Best Picture, Jared Leto won for Best Supporting Actor, and Matthew McConaughey won for Best Actor. It was seen as the high point of McConaughey’s career, starring in such a moving drama that must have taken every bit of his soul to pull off. The movie was great, he did a spectacular job, but I’m here to say that Mud is the better film. Not only was it surprisingly spectacular, but McConaughey fit his role much better in this film than in DBC, producing what I would call the best character of his career, hands down. The movie may be titled after the man pictured above, the catalyst for the film, but the lead character is a boy named Ellis. He’s a river boy, working with his father for enough cash to scrape by, living in a houseboat on the water that is his home. Ellis & his best friend Neckbone cruise the river on a daily basis, and one day head out to an island where an old boat has been washed up into a tree. The two mean to claim the wreck as their own, but someone is already living there. His name is Mud, he’s a local returning home, and he’s in a mess of trouble. Some dangerous men are after him, hence his hiding out on an island, but all he wants is to rescue the love of his life, Juniper, fix up the forgotten boat, and escape into the Gulf. With the boys’ help, he just might make it, but they soon learn that Mud has some dark secrets, that this fairy tale isn’t as simple as it seems, and that love can’t always conquer all. There’s a lot to touch on with this film, a lot of little things that make it so great. The biggest is McConaughey and the best performance I’ve ever seen him deliver, including Dallas Buyers Club. The latter might have taken more effort, but this character was perfect for him and so always felt real & easy. The boy, Ellis, was almost as good, playing the naive, romantic, street-tough country kid perfectly. And the side characters were excellent as well: his friend Neckbone, his parents, Michael Shannon in a small role. Only Reese Witherspoon failed to be great, but luckily her part was little. Speaking of Michael Shannon, he worked in a film also directed by Jeff Nichols called Take Shelter, a dark & disturbing drama that deserves your time. Anyway, Mud is a strong film with good acting, but also interesting music, a cool feel, some heart-pounding moments, true feeling, just a touch of Hollywood drama, and depth when it matters most. I will watch this movie just to get in touch with my childhood; I loved the first three films of the 90s and I played all the video games for the regular NES. But it won’t be good, it can’t possibly be good, especially with Megan Fox in it. I just hope it’s watchable. I’m a big American Idol fan, have been for eleven seasons. Reality shows are the only television I watch, even though I appreciate that they’re horrible. I use them as an escape, as a way to relax, to be completely entertained without having to put forth any effort. Some people do that with some movies, but I’ve never been able to. Instead I use American Idol. Now, I saw Jennifer Hudson perform and I also saw Jordin Sparks, both of whom appear in this film. They’re not the reason I chose to watch this movie, but I can’t lie, I saw their names and was intrigued. 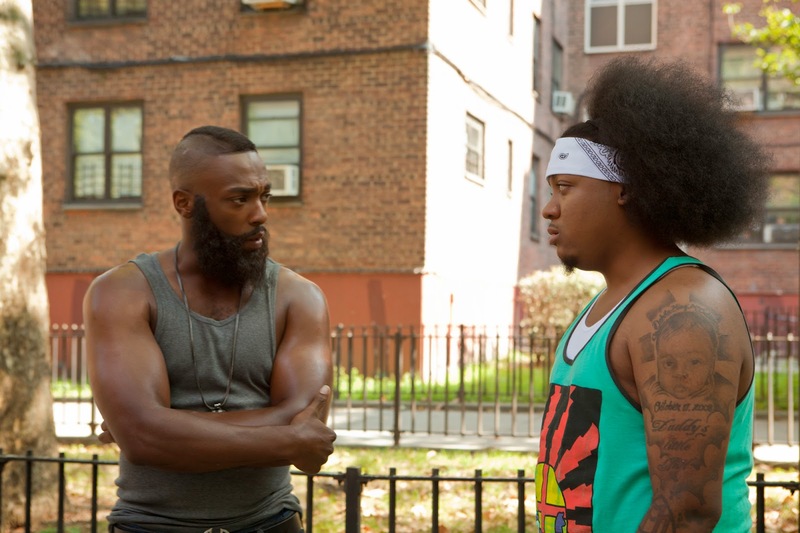 I was curious as to how they would do in such a heavy film, a story about struggling inner-city youth. Hudson won awards for her performance in Dreamgirls, although I happened to think that both she & that movie sucked. Anyway, Mister & Pete did turn out to be a heavy drama, one with a lot to say about growing up in the ghetto. Too bad it also featured some of the worst acting I’ve seen outside of movies that are intentionally awful. Mister is a boy with a rough life. His grades are horrible, kids at school make fun of him, he’s about the tiniest tween you’ll ever see, and his mother is a drug addict & a prostitute. The little money she makes working the street corner goes toward her heroine habit and there’s never enough money for food. Mister shops with his mom’s welfare card, but when even that runs out of cash the family is left with nothing to eat and no hope for the future. Mister wants to be an actor, to move to Beverly Hills, to get away from his horrible mother, to start a new life, and an upcoming audition might just be his ticket. But first he has to get to the audition, which is two months away, and that’s about to get a little more difficult. The police raid Mister’s apartment complex, searching the homes for any illegal activity. They find Mister’s mom drugged out, with needles scattered across the table. And so they take her in, never knowing that there’s a little boy hiding in the bedroom, avoiding a summer spent in a juvenile home. What’s more, he’s not alone. Mister is “babysitting” another local boy, a Korean kid named Pete whose mom also works the streets. So now the dynamic duo of Mister & Pete begin their independent life; buying groceries, avoiding the cops, trying to survive the heat of summer with no money and no hope. If only the boys can make it until the audition, the big break that Mister is sure to catch, then they’ll be on their way up, leaving this hard world behind. The Inevitable Defeat of Mister & Pete; quite a title, but one that basically tells you exactly what’s going to happen. This is no fairy tale, no romantic visual of tough times bringing about great things. It’s a gritty and depressing look at life in the slums, a realistic take on what children go through when their parents can’t or won’t give them what they need. The film did two things very well; representing this world & forcing audiences to feel it though sensory experiences. The story could have been over-dramatic quite easily, but stopped just short on a number of occasions. They kept the action & emotion real, showing us the situation and letting us understand how awful it was. And you could almost smell the desperation, the sweat of the boys, feel the heat of the apartment; not a fun way to spend 100 minutes but a very honest portrayal. So the story and setting were both very strong, creating a mood that was hard to take but enjoyable to watch & appreciate. If only the acting had held up its end of the bargain. I guess I’m not surprised that both Jordin Sparks and Jennifer Hudson were fairly terrible. Sparks made it feel like a Disney movie every time she came on screen, while Hudson is too much for me to handle. But I was surprised by how bad Skylan Brooks was playing Mister. It was ironic that in the film he wanted to be an actor, because his actual acting was no good. However, he was often saved by Ethan Dizon who played Pete, by far the best actor in the entire film. He stood out as the only one who was really invested in every scene, coming off much stronger than the star of the film, the supporting characters, and definitely the small-part cameos. And you could credit Dizon with saving the film for that matter, as his acting and character created the best part of the movie; the connection between Mister & Pete. Without that it would just have another sad ghetto movie but with some really bad acting. But with that relationship, the movie took off into the direction of a character drama set against an intense backdrop. The friendship that developed on camera between Mister & Pete was the highlight of the film, a ray of hope in a dangerous world, and the only thing that kept them both sane. It made the film watchable really, and gave it a depth that was desperately needed. There’s a good story here if you care to take the time, a well-delivered plot that is decidedly impactful. But you have to sift through the bad acting and grab onto the Pete storyline in order to survive until the end. Video – With an aspect ratio of 2.35:1, the video of the film is excellent. It was shot using an Arri Alexa camera with Cooke S4 and Angenieux Optimo Lenses. The picture quality is very high, crisp & clean with no balancing or color issues. The scenes are almost too vivid, lending no added grit to the visuals. But it’s an unfiltered look at the world, a raw & vivid picture that’s hard to ignore. Audio – The DVD was done in English 5.1 Dolby Digital. There is an option between English & Spanish subtitles in the Set Up menu. The audio quality of the film was without flaw, a clear sound that, again, let the emotion of the film speak for itself. The music of the film never made an impact or called for my attention, but it also wasn’t distracting, which I appreciate. Extras – There are quite a few extras on this disc. Commentary can be turned on to accompany the film, with director George Tillman Jr. and actors Skylan Brooks & Ethan Dizon. There is a music video by Alicia Keys called “Better You, Better Me” that is over four minutes long and features footage from the movie. There are ten deleted scenes with an option for commentary throughout and a Play All mode. You can go behind the scenes and watch 11 minutes of rehearsal to scene comparison, in which Brooks practices a shot and then we see the actual scene from the movie. There are two “Bootcamp” segments, research for the film, one on skateboard training and one on drug addiction. And lastly there are four trailers: Things Never Said, Free Angela, Temptation, and Precious. Rent It. The Inevitable Defeat of Mister & Pete is a hard film to watch. At times that’s because of the subject matter and often that’s because of the bad acting. But overall, thanks to Pete, I found myself enjoying the story. He and the plot were definitely the highlights, with the other actors in the film the low. So if you’re someone who can forgive a little more than I can, then you might just find this a wonderful film. If you’re harder than me, then I’d recommend staying away. The video & audio were both very strong and the DVD has a ton of extras. This is a film that I won’t forget quickly, I’ll give it that, but for both good & bad reasons. As a former theatre nerd, I can’t decide if this is the best or worst thing ever. Part of me loves it; a strange and extra-horrific take on Phantom mixed with the old campy slasher style. But the rest of me thinks it’s going to be awful; Meat Loaf as a drama director, a girl fighting a psycho killer, dumb thespian jokes. I think it’ll end up being either a very high 4 or a very low 2, I just can’t tell which. It’s been said that film critics can’t help but love Wes Anderson. I can’t argue the point since I do in fact love him, or at least the majority of his work. But in my defense, I was a Wes Anderson fan before I ever dreamed of being an actual film critic. I saw The Royal Tenenbaums at a very formative time; right after I graduated high school. I was seventeen, not sure what to do with my life, and experiencing the adult world one impactful bit at a time. I chose film as a way to define my taste and artistic attitude, having grown up watching movies and always having been a critic at heart. And so I saw Tenenbaums and it’s still my #1 favorite film of all time. I began to soak up Anderson’s other films: Bottle Rocket, Rushmore, and Life Aquatic soon after. In later years I would see Darjeeling Limited, Fantastic Mr. Fox, Moonrise Kingdom, and finally The Grand Budapest Hotel. With the exception of Darjeeling, none of Anderson’s other films approached Tenenbaum status until now, Grand Budapest being the strongest of his films since I first saw the one that changed my life. Told in flashback by a man who lived it, the story of the Grand Budapest Hotel is both wildly fantastic and incredibly heartbreaking. Meet Zero Moustafa, a refugee from a war-torn land who has come to the famous European hotel to begin a better life. He signs on as Lobby Boy under the respected and enigmatic Mr. Gustave H, the concierge of the hotel and the lifeblood of every event within it. Gustave takes Zero under his wing, teaching him the secrets of a good hotelier, and becoming his fast friend. So when one of Gustave’s mistresses dies, leaving behind a great fortune, the pair become blood-brothers & co-conspirators, attempting to win their share of the wealth. But it won’t be easy. Dmitri, the evil son of the deceased, wants the entire treasure for himself, threatening anyone who comes between him and what he sees as his rightful inheritance. Gustave & Zero must survive & connive in order to keep their loot; evading the military, escaping prison, dressing in disguise, falling in love, and ultimately creating a bond between each other that will never break. 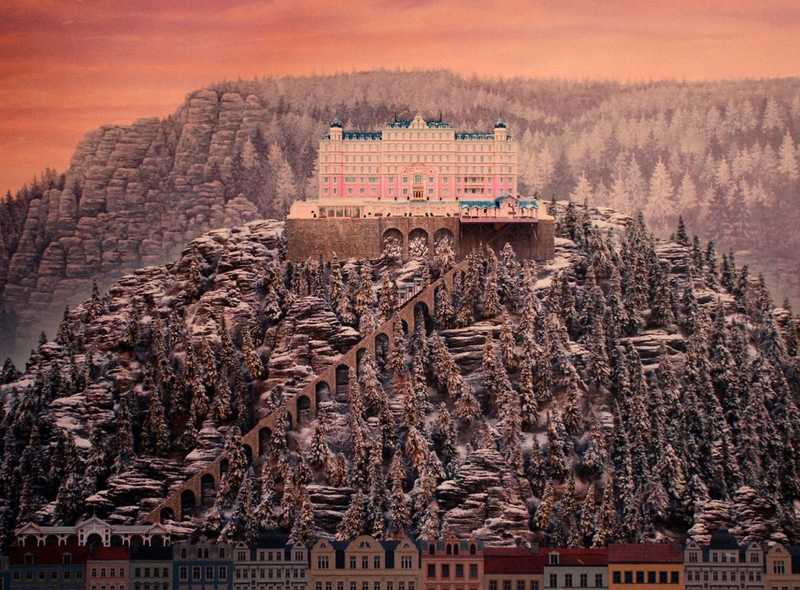 Wes Anderson is talented beyond belief. The amount of energy & detail that he puts into his films is unparalleled, crafting every single moment of every single scene with a genius that I’ve never seen before. How can I help but love his movies? The music, the colors, the attention to set, the beautifully bizarre characters, and of course the stories that somehow seem so mythical and so relatable at the very same time. 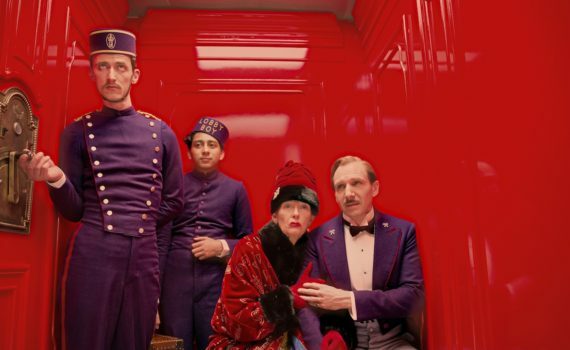 Grand Budapest is just another in a long line of his movies that works on every level. The story is magical, set in a world of fairy tales on a mountain high above the doldrums of every day life. The group of oddballs who live in the hotel & surrounding countryside exhibit every aspect of humanity, both positive and negative. The songs in the background, the expected use of pink, the quirky dialogue, the impeccable comedic timing; it all screams Anderson and I immediately fall in love. If that makes me a biddable film critic who would rave over anything he put in front of me, then so be it; I’ll take the odds and expect perfection. 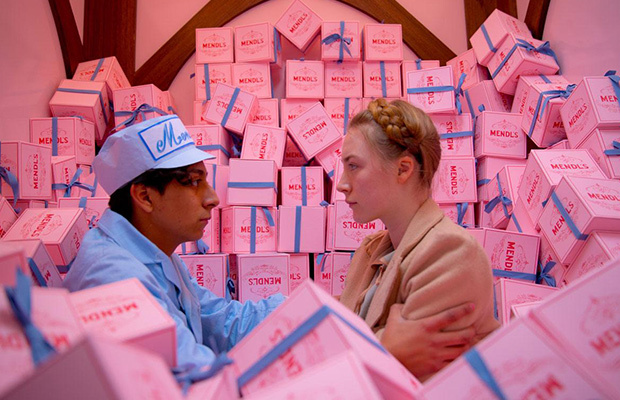 But the greatest part of Grand Budapest isn’t the standard Wes Anderson touch. It isn’t the camera work or the direction, the acting or the music. No, the piece that makes the film wonderful is the connection between the two main characters, the love shared by Gustave & Zero, and the sadness of knowing that nothing lasts forever. Tenenbaums worked because it had an emotional depth that is hard to put into words, you can only feel it and sigh. Darjeeling worked for the same reason, as did Rushmore for that matter. Anderson lays out his artistic style, brings a story into his world, but allows the characters to speak for themselves. And that’s exactly what happened in Grand Budapest. Gustave & Zero become the reason for watching, pushing all other filler aside. Not that the extra fluff was bad, far from it. The comedy was intense, the action was surprisingly adult, and all the cameo actors were perfect in their roles. Willem Dafoe, Harvey Keitel, Bill Murray, Jason Schwartzman, Tilda Swinton, Tom Wilkinson, Owen Wilson, Bob Balaban; everyone had a small part to play and they played it well. I assume it’s hard to be a director, but Wes Anderson makes it look so easy, pumping out films that are in a league of their own, stories I could turn around and immediately watch again. The Grand Budapest Hotel is right up there with Anderson’s best work, a must-see for his fans, an artistic masterpiece that can’t be denied. I feel like this is almost a plot that can’t possible be done right. Maybe in a book, but I don’t think it translates to a movie. A much as I think it looks cool and kind of want to see it, I just can’t imagine that the woman plays the robot well or that the emotions that are the point will really come across the screen the way they’re supposed to. 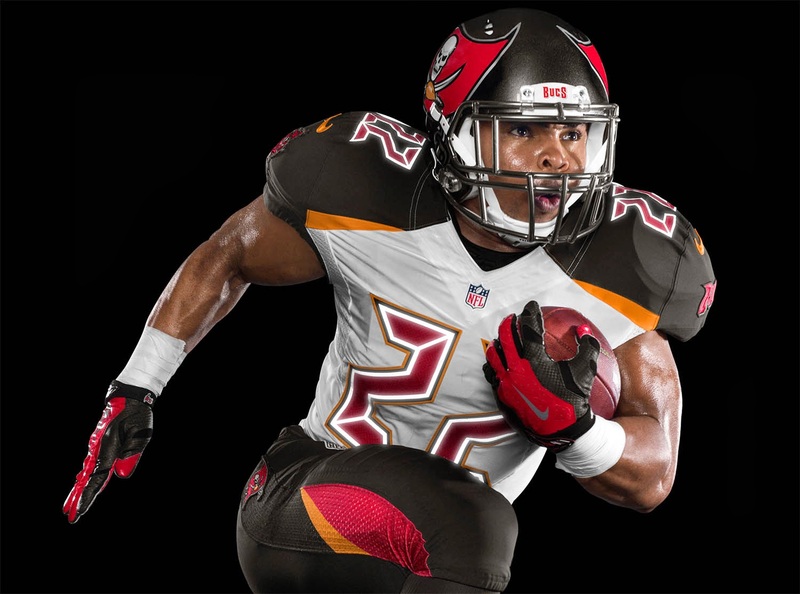 Around this time last year I was taking a look at the uniform changes in the NFL. We had the Dolphins & Jaguars making pretty major changes and the Vikings making some tweaks. 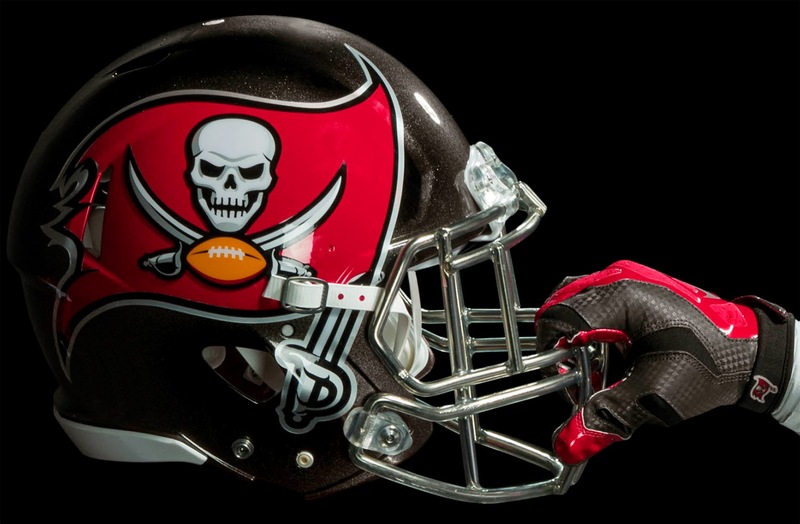 This year the only team making any noise is the Tampa Bay Buccaneers. Their new look is causing some stir. Some people like it, some think it’s a hideous transformation. Here are a few pics, take a look, and decide for yourself. Gone is the pewter, back is the creamsicle orange, if only in a very small amount. People really hate that orange. But what they also seem to strongly dislike are the graphic numbers. They are quite unusual and won’t really fit in with every other team. 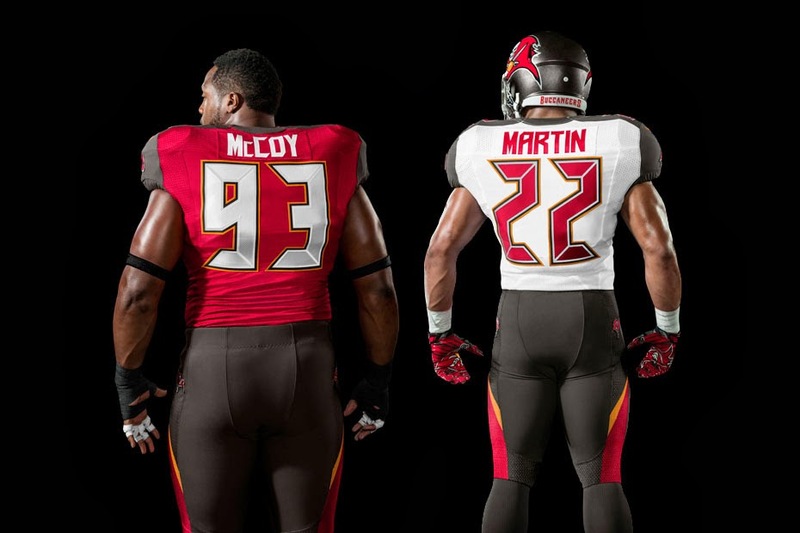 I guess that’s my biggest concern; that these uniforms won’t feel cohesive when matched up opposite any other team’s. 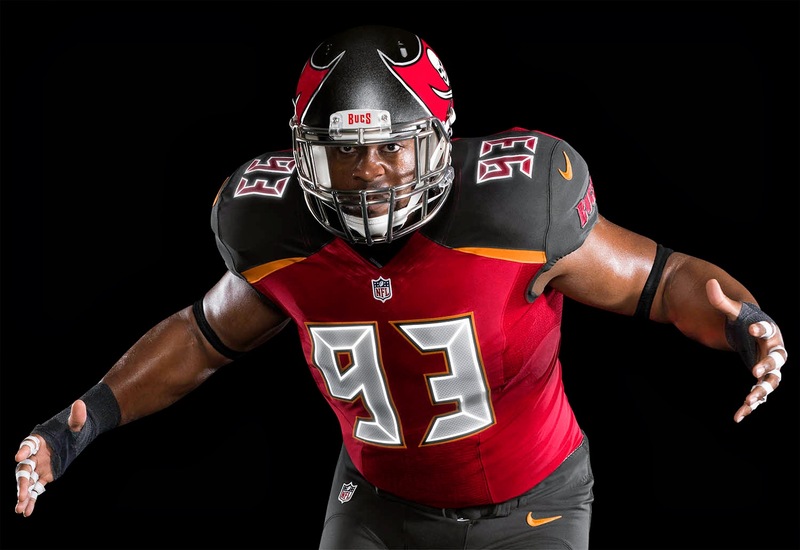 That flag on the helmet is definitely large, taking up the entire side. 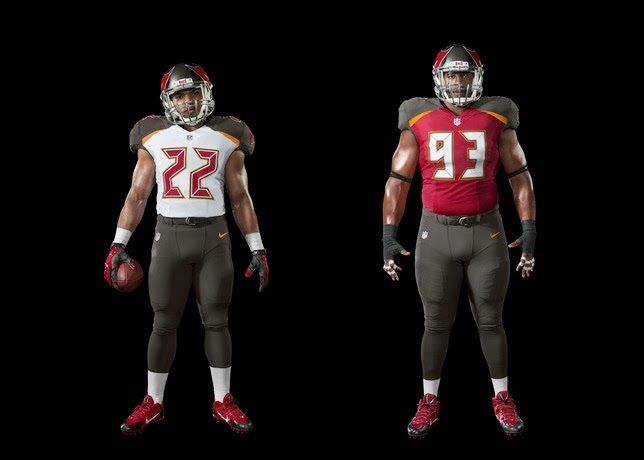 All in all I don’t think they’re ugly, but they look more like uniforms I might create in a video game and not like professional football jerseys. 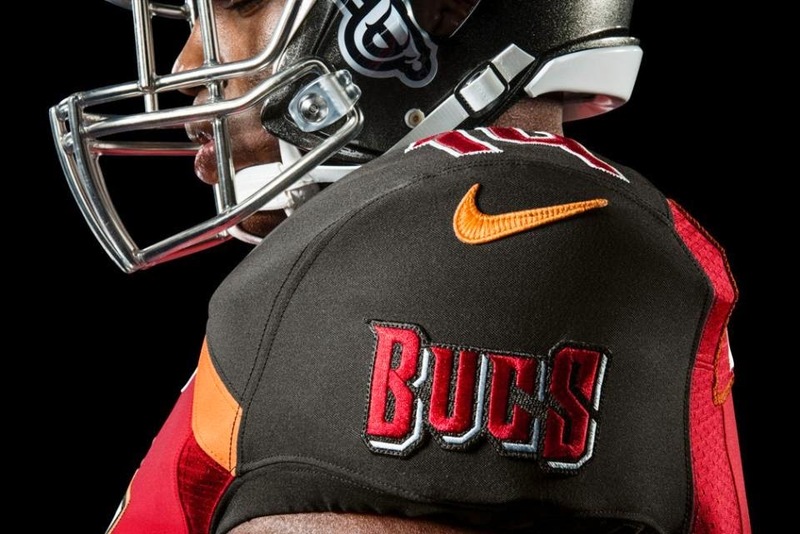 Or actually, they look a little like the Las Vegas Outlaws of the old XFL, which was my favorite team. He Hate Me! Now here’s a tween movie I can get behind, but maybe only because I haven’t read the book. It looks a ton like the 2nd Hunger Games with a little Stephen King short story thrown in. Now, I’m not saying it looks good, but I won’t have the book to compare it to, there should be some cool booby trap action, and I’m honestly curious right now as to why the characters are in this maze. I was originally intrigued by the trailer for this film because I haven’t seen a ton of Gothic horror. The horror I usually watch is campy, silly, or zombie. I’m not used to the dark, sinister, religious, heavy drama of Gothic horror and the creepy stories that underline their plots. So my interest was piqued by We Are What We Are because of the genre it would represent, but also because it had been done before. It’s a remake of a Mexican film; a gruesome tale of family, fervor, and murder. I probably should have checked out the original first, because now I don’t want to. It’s not that I didn’t enjoy the movie; it was a strong film that might push me to others like it. But I can’t imagine watching this twisted plot again, seeing the violence and the darkness one more time, so I think I’ll just stick with this version and try not to have a nightmare. The Parkers are a reclusive family who practice the old time religion. The patriarch of the clan demands strict obedience and constant ritual from his children, controlling his household through religion and fear. In their solitude, the family keeps a secret, one so damned that they dare not speak of it outside their home. But when the mother suddenly dies, events begin to spiral out of control and the truth of the Parker’s ancient rite may come to light. Sisters Rose & Iris begin to rebel against the old customs, wishing for a normal life of love & happiness, one that has been denied them all these years. But their father won’t relinquish his control that easily, fighting to hold on to a family that is quickly slipping away, meaning to keep them together no matter what, even in death. Talk about skeletons in the closet. The family in this story is one terrifying and screwed up bunch. The plot is based on their practices, their inner struggles, and their relations with the outside world; a mess of emotions that drive the action of the film. And it does have a nice driving feel, a brooding & sinister atmosphere that keeps you on the edge of your seat. It’s violent, disgusting at times, sad throughout, and constantly dark. The actors all do a great job portraying the twisted characters, especially Michael Parks as Doc Barrow and Julia Garner as Rose Parker. All the action is clean, never stupid, and always high impact. I was left with the urge to watch more from this genre, heavy & horrible films that rely on great depth & good acting more than fake blood & screaming coeds. Not that I’ll stop watching zombie movies, but this was a refreshing break from b-horror; a peek into the black chasms of the human soul and a well-crafted film overall.